Rafael Aguirre is an internationally acclaimed musician whose deep understanding of music, dazzling virtuosity and immensely diverse repertoire has taken him to 34 countries. The beginning of his extraordinary career was marked by winning thirteen first prizes at international competitions (including the Tarrega Competition and Pro Musicis, New York). He is currently one of the most celebrated guitarists worldwide. His debut at the Verbier Festival in Switzerland performing Rodrigo’s Concierto de Aranjuez with the Verbier Chamber Orchestra was broadcast by medici.tv, and is the most viewed video on their Facebook page, which gained over 3 million views in just twelve months. An extensive repertoire, with more than 30 concertos for guitar and orchestra has allowed him to perform with the KBS Symphony Orchestra in Korea, the Orchestre National de Lyon, Toulon Opera Symphony, Baden-Baden Philharmonic, Thüringen Philharmonic, Pforzheim Chamber Orchestra, New Westfalia Philharmonic, Robert Schumann Philharmonie Chemnitz, Moscow New Russia, RTVE Symphony, Malaga Philharmonic, Cámera Musicae Symphony, Extremadura Orchestra, and the Castilla y León Symphony Orchestra, among others, under conductors such as Jesús López Cobos, Lorenzo Viotti, Karina Canellakis, Miguel Ángel Gómez Martínez, Yoel Levy, Pavel Baleff, Guillermo García Calvo, Sebastian Tewinkel, Clemens Schuldt and Alexandre Myrat. In his solo recitals, Rafael aims to show the versatily of his instrument, including original guitar works, transcriptions from the orchestral and piano literature, latinamerican music, flamenco, film music and even pop and rock. With a repertoire of over 30 concertos for guitar and orchestra, Rafael Aguirre wishes to explore the different conceptions which make the guitar blend with the symphonic repertoire with its characteristic tone and lyrical expression. This well-established duo has been active since 2011 and offers a charismatic approach on a very varied duo repertoire. Nedège Rochat's ex-Vatican Stradivarius cello finds an optimal balance with Rafael Aguirre's playing. Their debut CD "La Vida Breve" was highly praised by magazines like The Strad and Gramophone. This collaboration will start in the season 2018/19 and will feature some of the most relevant repertoire for guitar and other instruments (Boccherini, Schubert, Castelnuovo Tedesco) with members from one of the world's leading musical institutions. This project with the Peruvian bandoneonist and pianist Claudio Constantini shows the most popular side of the guitar, through the latinamerican repertoire, some incursions in the Spanish repertoire and other very contrasting styles. This album, which has been highly praised by international critics, is a musical voyage with French-Swiss cellist Nadège Rochat, exploring Spain and South America. The guitar gives a very special tone addition to a singing and vibrant cello. Rafael’s first non-recital CD and recording collaboration with other musicians. This Brazilian album approaches Milhaud’s outsider’s vision and classical Brazilian folk by popular musicians like Pixinguinha. The repertoire’s quality on this album is unsurpassed, being an unusual guitar album with music by Bach, Schumann, Mendelssohn, Ravel, Debussy, Gershwin and Scarlatti. This is an enormous challenge for any guitarist. 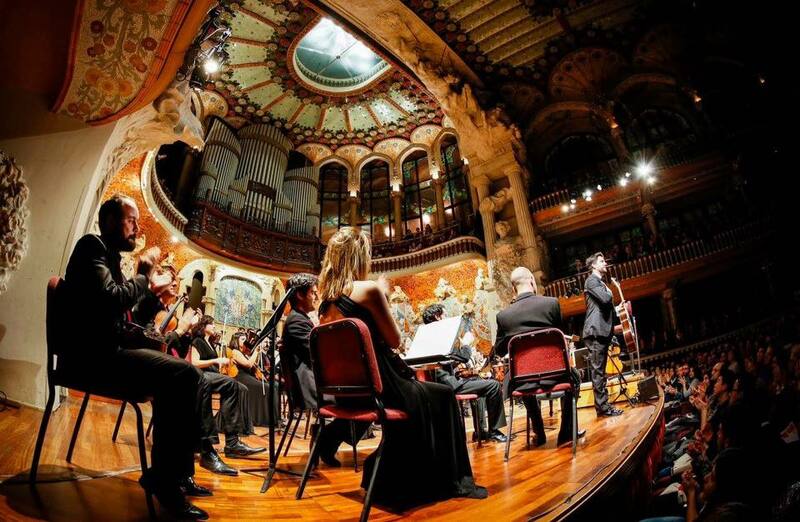 This is a special homage to Spain, with composers that have been inspired by this country within it and outside it. Folk music, Zarzuela, Impressionism, Nationalism, Flamenco and even Sergio Assad’s giving his Brazilian vision about Spain. A Spanish tour de force. This is a very cosmopolitan album, presenting a journey through Rautavaara’s finnish sounds, Ibert’s, Ohana’s and Poulenc’s France, Clerch’s Cuba and Villa Lobos’ Brazil, which are joined by the traditional guitar repertoire by Sor and Tárrega. This album shows Antonio José’s and Manuel M. Ponce’s impressionism, Paganini’s virtuosism, Daniel Real’s dreaming sound illusions and Castelnuovo Tedesco’s romanticism.